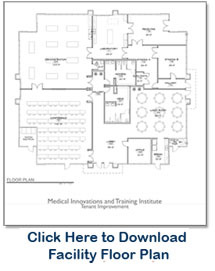 Welcome to Medical Innovations and Training Institute in Las Vegas. MITI is your one-stop shop for anatomical education. Our single-level, 9,000 square foot facility built in 2010 boasts a 10-15 station lab with the most modern presentation equipment available. Our anatomical concierge can arrange all specimens and general instrumentation. We can also provide all transportation, catering in our on-site cafeteria or anything else you need to make your training a success. For more information simply click on the button below and fill out the contact form. Do you have a question or need more information on using our facility? Call 702-233-6484 or click on the button below.